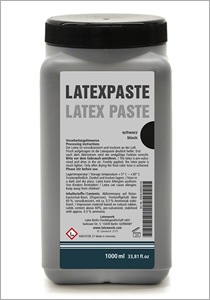 Thick latex paste for various applications. Suitable for effect make-up structures. For smooth impressions with little details. For the stabilization of detailed impressions, which were prepared with liquid latex. Several thinly applied layers, dry faster than a thick layer. We offer our latex in three fluid grades (viscosities). These can be mixed with each other as desired. The same applies to the colours. From the primary colors every new colour can be mixed. Additional liquid latex can be found in the selection below.